This adapter is intended to satisfy remodeling construction standards requiring that E26 medium screw base sockets be removed to get energy saving tax credit. Instead of replacing the socket you can just screw this adapter into the socket. The adapter, once screwed in cannot be removed. This converts the E26 socket permanently into a GU24 socket. 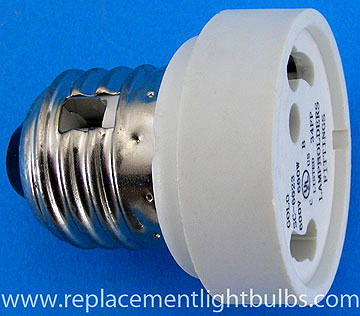 You can then use 120V, self ballasted, GU24 based bulbs in the sockets. Here are some lamps we sell that you can then use in these socket adapters.